Continuing his journey from Way of the Peaceful Warrior, Dan moves from Honolulu to the Mojave Desert, and from a bustling Asian city to a secluded forest, until he uncovers the mystery of The Hidden School. While traversing continents, he uncovers lessons of life hidden in plain sight—insights pointing the way to an inspired life in the eternal present. Along the way, you’ll encounter remarkable characters and brushes with mortality as you explore the nature of reality, the self, death, and finally, a secret as ancient as the roots of this world. Awaken to the hidden powers of paradox, humor, and change. Discover a vision that may forever change your perspectives about life’s promise and potential. Dan Millman, former world champion gymnast, coach, martial arts teacher, and college professor, is the author of seventeen books published in twenty-nine languages and shared across generations to millions of readers. His international bestselling book, Way of the Peaceful Warrior, was adapted to film. Dan speaks worldwide to people from all walks of life. In Way of the Peaceful Warrior, Dan Millman established himself as a master of teaching through story. Now, in this exciting adventure, he reveals how deep learning can be found in unexpected places. The wisdom he shares will illuminate many lives. Dan's new book is must-read journey of transformation. Few other books so skillfully combine story and substance than this peaceful warrior adventure. Dan Millman’s conclusion to his peaceful warrior saga is a remarkable odyssey of life, death and meaning — the fully-realized completion of a unique spiritual adventure. What a privilege to travel this unforgettable journey with him. This epiphanous work will stay with you long after you’ve read it. The conclusion to Dan Millman’s life-changing Peaceful Warrior saga was well worth the wait. This riveting quest through many exotic locations reminds readers what it means to follow a spiritual path in the modern world. Millman’s journey includes memorable characters and daunting challenges on the way to wisdom and inner peace. It’s a book for anyone interested in life's bigger picture and deeper currents. A brilliant sequel to a timeless classic. Well done. I highly recommend this treasure. 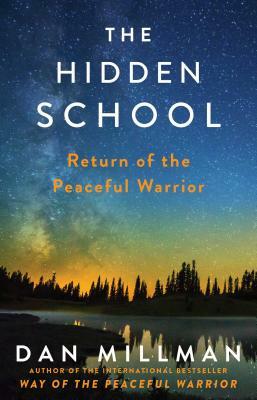 Dan's new book, The Hidden School, reminds me of the magic and mystery of the Way of the Peaceful Warrior. This suspenseful, often humorous adventure, shows the way to our own light, our own music, and our own way home. When I experienced Adrenal Fatigue Syndrome in Tahiti back in 1986, the Way of the Peaceful Warrior literally saved my life. Keep on keepin' on Dan. I'll always be there with and for you. Thank-Q brother. The Hidden School is filled with beautiful lessons that challenges your ideas of reality and pushes you to live a more inspired life. In this compelling story, Dan Millman takes us on a quest for the secret of eternal life. He moves easily between worlds, using external action-adventure as a metaphor for an internal spiritual quest, providing both entertainment and self-reflection. The Hidden School brings to mind the adventures of Carlos Casteñada and mysterious quest in The Da Vinci Code. This is a page turner, both entertaining and provocative. If you can only take one book to read on your next vacation, this is that book. With a masterful touch, Dan Millman's The Hidden School will transform the way we navigate our journey in the seemingly everyday events of life, inspiring us to discover their hidden magic, all the while igniting the mystical essence within ourselves. Dan Millman has done it again. THE HIDDEN SCHOOL completes the book cycle he began with THE PEACEFUL WARRIOR, bringing the story full circle. This book is the most intriguing of them all, as Millman takes his readers into invisible worlds, cross-oceanic voyages, and encounters with incredible sages. The lessons in this book are both profound and simple -- and many people who read it will never see reality in the same way again. So be forewarned. Read THE HIDDEN SCHOOL at your own risk! Indispensable and accessible this book is a wonderful resource filled with profound teachings presented with clarity and wisdom. Dan’s complex and thoughtful story will remind you of who you are, while awakening your life in the process. "Ever since Dan Millman published "Way of the Peaceful Warrior” I have been a fan and have looked forward to his next book. Many of my colleagues, friends and clients have been the grateful recipients of his books. In “The Hidden School” Dan takes the reader on a physical , psychological and philosophical journey that is fun and suspenseful . His writing is clear, humorous and compassionate. I especially appreciate the way he tackles paradox and contradictions. Readers will also benefit from his thoughts on reconciling divergent thoughts and feelings.Dan accomplishes this (and many other issues) in a gentle, sometimes self-effacing manner that gets the points across without dogma and over intellectualization. I’ll be giving out many more copies.